Part my family is South-Indian and I have frequently heard my mother and aunts gossip over what earring they bought and which muthu-jadai should be worn for my cousin’s wedding. I for one was never the type to wear jewellery, but the intricate gold motifs always did fascinate me, though I wondered at the amount of importance given just to jewellery at any Indian wedding. But as I grew up and landed a job that requires me to write about weddings on a daily basis, it hit me that ‘importance’ just might be an understatement! The bride might be dressed in the best, most expensive Kanjeevaram saree or the trendiest Sabyasachi bridal lehenga. But though the two are poles apart, one thing remains constant: her elaborate, statement-making bling. As jewellery plays such an important role in completing any bridal outfit, picking the right one seems like a monumental task. Especially when there are sooo many options and you just happen to clueless about what exactly each one is. (Just like me a few months back). So I thought a guide to South-Indian bridal jewellery may help narrow your hunt and also broaden your jewellery knowledge. If you’re a bride that loves gold, then you have come to the right place. Temple jewellery might just be the perfect wedding pick for your big day! Read on for a detailed idea on all you need to know about South Indian bridal jewellery. Temple jewellery first originated in South India during 9th century, under the reign of the Chola dynasty. It was mainly used as offerings to temple deities and idols, which is where it gets its name from. Apart from this, it was also worn by kings, queens, noblemen and temple dancers. It is usually heavy jewellery that uses pure gold metal and incorporates intricate motifs of idols, dancers, nature and also designs such as waves, dots and zig-zag patterns. In addition to this, it also uses precious and semi-precious stones like rubies, emeralds, diamonds and kemp stones for embellishment. On an average, a pair of earrings could cost you 80,000 – 1 lakh while a necklace would be bought at a minimum of 3 lakhs. 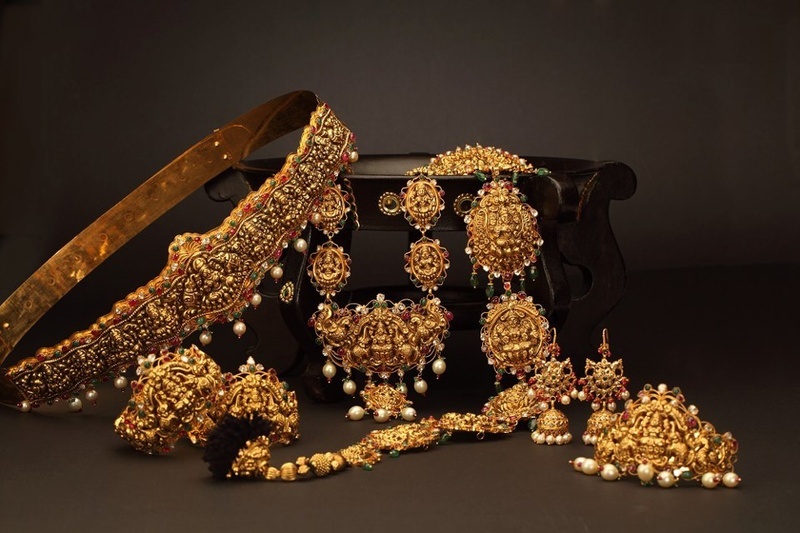 An entire bridal set, that includes everything from a maang-tikka to payal, would be available at a price of 8 – 15 lakhs. Authentic temple jewellery tends to be very highly priced so to reduce the cost, the purity of the gold can be lessened and stones of a lesser value can be incorporated. Temple jewellery used to be custom-made by skilled goldsmiths and master artisans but nowadays, it is easily available at popular stores like Joyallukas, Josallukas, Tanishq and Bhima jewellers. It is also available online but we suggest you personally make the trip and hand-pick your jewellery.